I’ve had lots of fun these past few months quietly setting up this blog … purely for aesthetic ambitions rather than commercial. However, I told myself I would pause and ponder when I got to 50 followers, and I am pleasantly surprised to say that number is creeping up. I have set up a really quick survey to help me make some decisions about how to move forward with Grace and Gusto. Your help would be super dooper appreciated. I am just curious to know what sort of information, inspiration and aspirational value people are looking for in the crowded food blogging marketplace. If I am to shape G and G into something that continues to feed my creative outlet needs, I want to make sure I am also sharing something that adds value to you too. So I will leave it with you … make yourself a green tea, espresso or whatever hot drink hits the spot for you, and know that I am grateful for your help with this quick questionnaire. 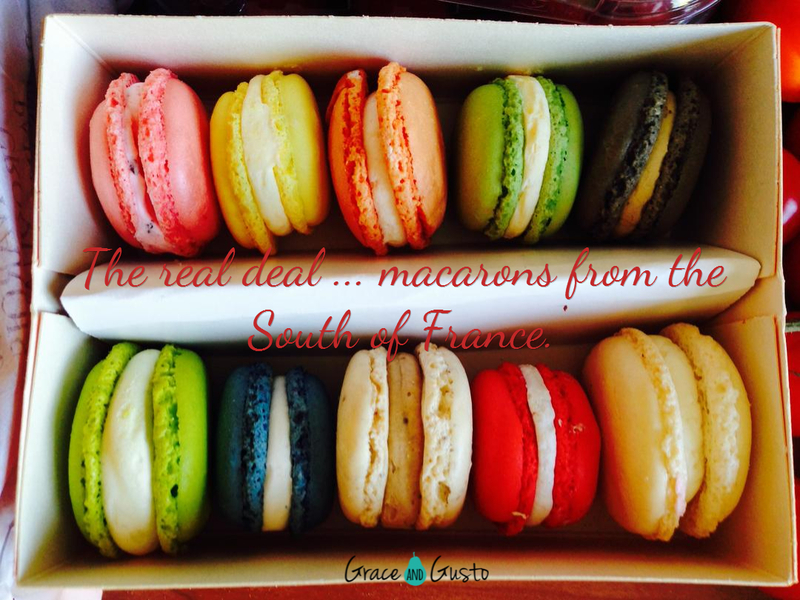 Categories: Food | Tags: graceandgusto, graceandgustofood, macarons, macaroons, survey | Permalink. It’s cooling down so comfort food is my go-to for midweek dinners but tonight I didn’t feel like a heavy meal. I always find the temptation with casseroles or stews is to eat too much. So I opted for soup and stuffed mushrooms to up the vege intake and avoid my usual carnivorous antics. I made a sweet potato, parsnip and coconut cream soup … recipe to follow later this week. 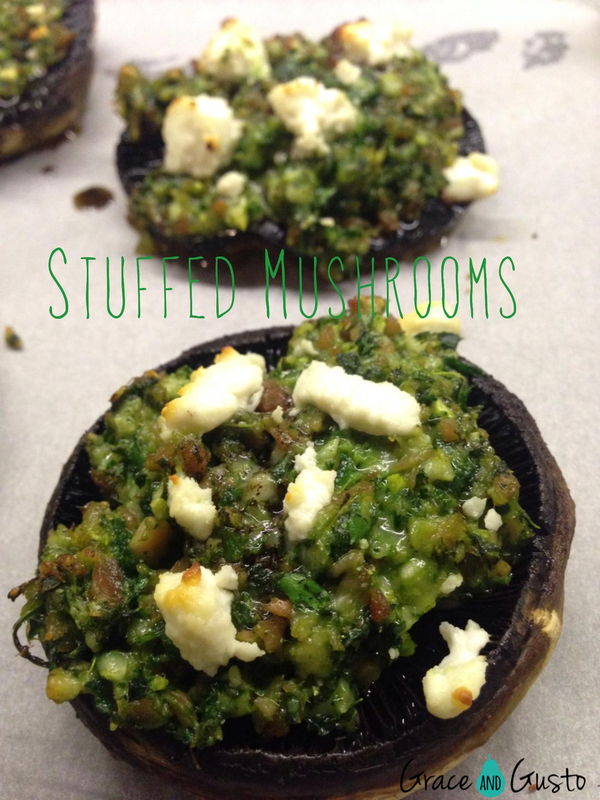 And the stuffed mushrooms were super quick and easy and disguise lots of good nutrition. Preheat the oven to 180 degrees or you could use a grill. Melt the butter in a pan and brown the top of the mushrooms for approx 3-4 minutes. Remove from the pan and rest on a paper towel while you make the stuffing. Combine the herbs, garlic and proscuitto in the food processor or Thermomix until finely diced (TM speed 7 for 20 secs). Add the baby spinach and grated parmesan and blitz until combined (TM speed 5 for 5 secs). Divide the stuffing among the mushrooms and top with crumbled goats cheese, salt and pepper. Super easy, ultra tasty and full of goodness! 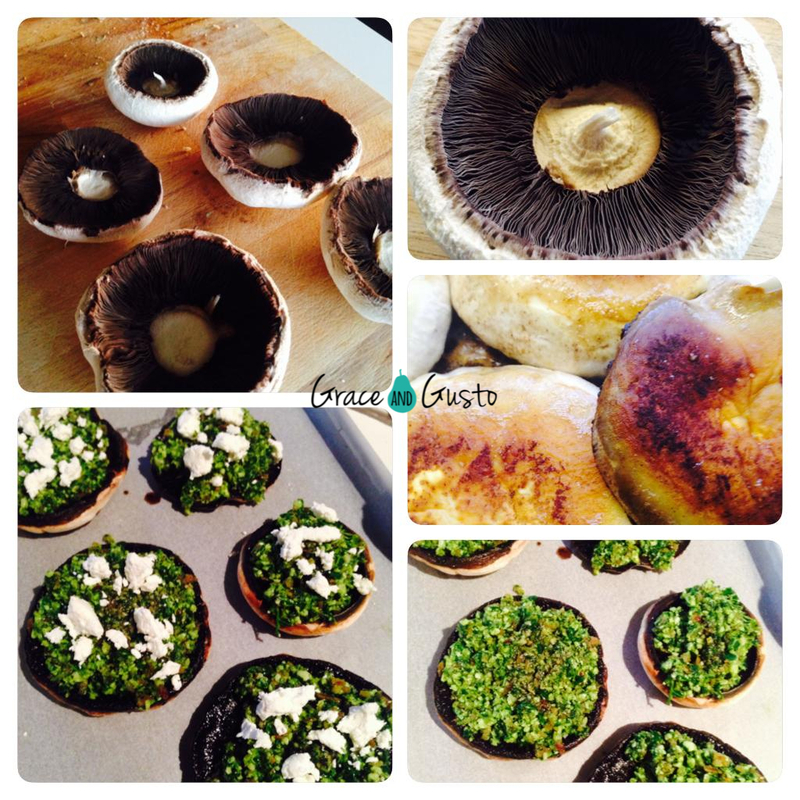 Categories: Food | Tags: graceandgusto, graceandgustofood, midweek, mushrooms, soup, vegetables | Permalink. If I could hook myself up to an IV of superfoods each day without piercing my skin, I would do it. But the next best thing I believe, is smoothies. They’re hugely “on trend” at the moment, and for good reason – it’s a very efficient way to boost your nutrient content each day. It’s also a lot of fun to play around with various flavours. I never seem to have exactly the same type twice, but for a quick afternoon snack that is dairy free and gluten free, I pulled together one of my favourite combinations and actually remembered to take note of the quantities I used so I could share it with you … I call it my chocolate thickshake. 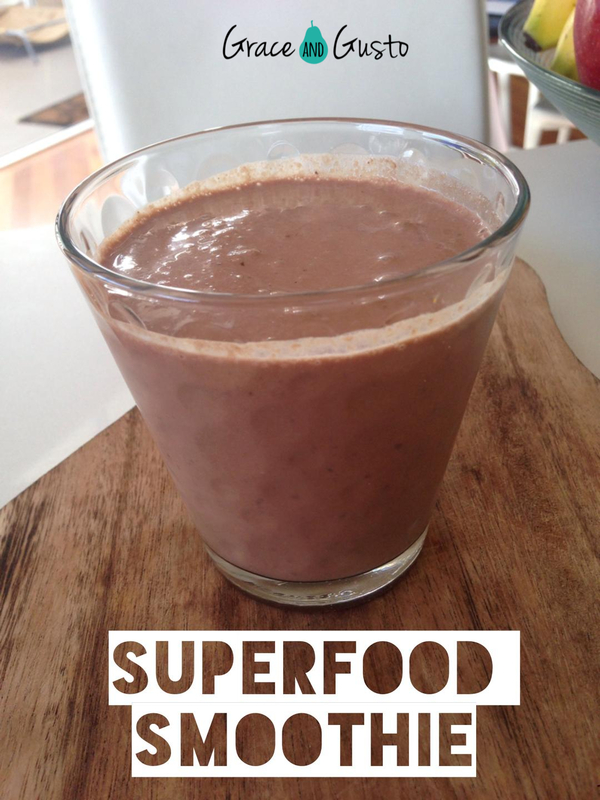 Using a blender, Vitamix or Thermomix, mill the cashews with the medjool date until very fine – approximately 45 seconds. Add remaining ingredients and blend at a high speed for up to 2 minutes to ensure a thick, smooth consistency. Categories: Fitness, Food | Tags: cacao, graceandgusto, graceandgustofood, maca powder, smoothie, snack | Permalink. 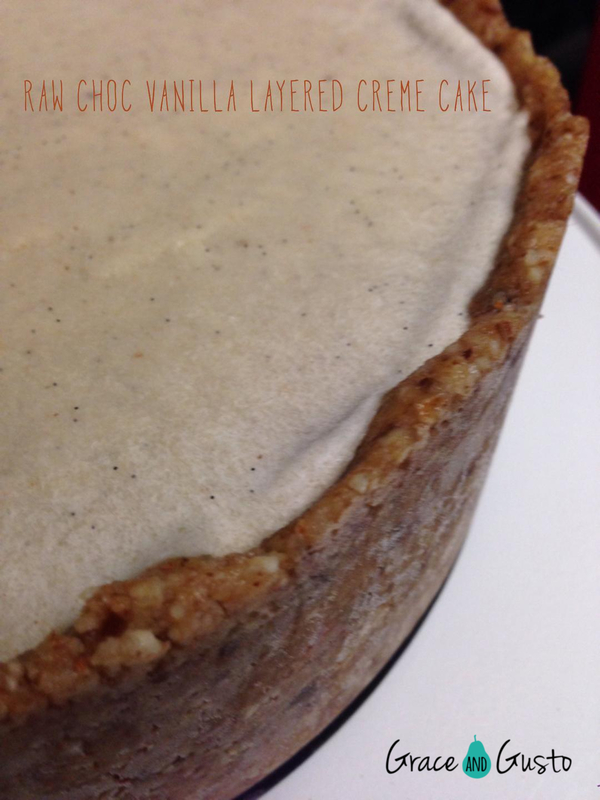 Okay so I thought I could get away with posting a recipe just for Thermomix owners. But I am pleased people are so keen to get into real chocolate … so if you don’t have a Thermomix, here is how to create your raw chocolate sans TM. Melt your cacao butter in a bowl over a saucepan of gently simmering water. Don’t melt it too quickly and keep stirring as it melts. If you have an induction stovetop, you could transfer the melted cacao butter to saucepan over a low heat and add all the other ingredients, stirring for about ten minutes until it has emulsified well together. It probably wouldn’t hurt to give it a good brisk whisk towards the end to ensure the honey is mixed through. If you don’t have induction, you’re best to stick to a bowl over simmering water to constantly whisk in all your ingredients until tempered and dissolved. * My favourite brand of bought raw chocolate is Loving Earth – available at Flannery’s and Wray Organics stores. The price is about $6.50 for 100gms which is pretty good considering the quality of the ingredients. You’ll find you only want to eat a small amount at a time as it is much richer than rubbish milk chocolate. * A friend suggested mixing in coconut milk if you don’t like it too dark. I haven’t tried this myself but it sounds yum!! I don’t trust people who don’t eat chocolate … that may sound like a harsh judgement, but I just believe they haven’t tried REAL chocolate. It’s so good! For me, gone are the days when I get excited about shovelling as much Cadbury Dairy Milk down my throat as I could with a knife and fork before someone else rolled a six on the dice (anyone else a kid in the 80s?). 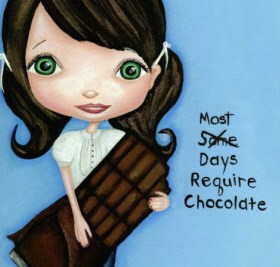 These days, I am a self-confessed chocolate snob. The fact is, you can eat chocolate every day – and I would even go so far as to say we should eat chocolate every day. 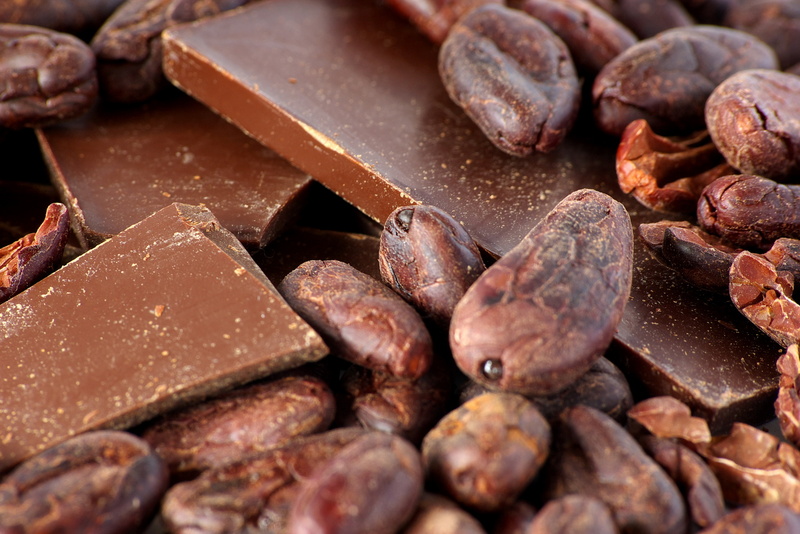 The nutritional benefits of cacao have been buried by the plethora of below average “chocolate” products available. Let me explain what kind of chocolate I am talking about … as there still seems to be confusion over chocolate, cacao, cocoa and all its various delivery methods. The fruit of the cacao tree has a small bean in it which is where all chocolate comes from. This bean contains energy-boosting nutrients rich in magnesium, iron, zinc, potassium copper and manganese. The Aztecs and Mayans first used the cacao bean for medicinal purposes and created a ritual drink which was used to celebrate marriage – this is the first known link between chocolate and romance. Cacao tastes quite bitter. Sugar is so often added to sweeten chocolate products, and this is why chocolate is perceived as a “junk food” because the level of sugar often outweighs the nutritional value of cacao once it has been processed into the end product. Cacao nibs are simply the shelled and crushed beans. Raw cacao powder is what you end up with when you cold press the unroasted beans and remove the fat (this is cacao butter). This keeps all the enzymes alive and the nutrition intact. Cocoa looks just like raw cacao powder but its quite different – it comes from the beans that have been roasted at high temperatures. This process removes the valuable enzymes and kills off many nutrients. Research has shown that raw cacao lowers insulin resistance, lowers blood pressure, reduces your risk of stroke and cardiovascular disease, slows down the aging process, shield your nervous system from damage, guards against toxins and boosts your mood! So hopefully this gives you enough reasons to investigate how you might be able to squeeze some raw cacao into your daily diet. 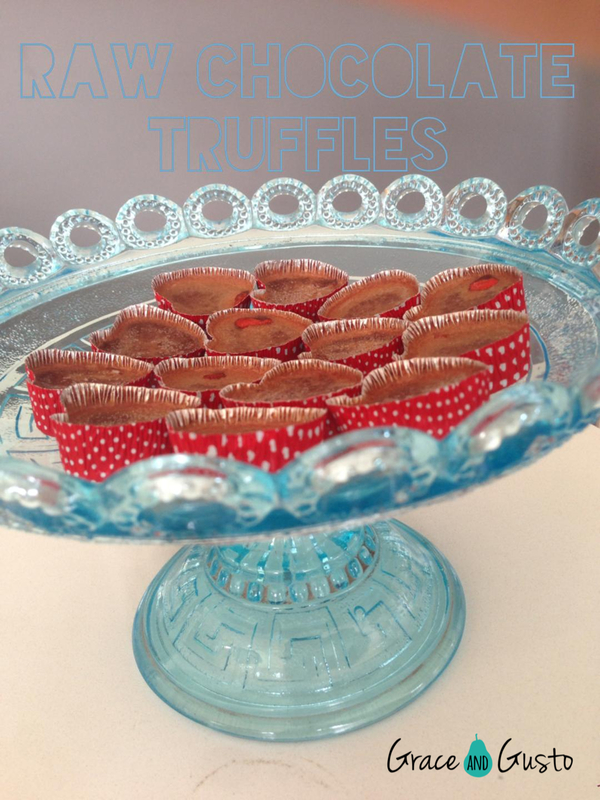 These are the easy ones … and I made some truffles you can try. I made these to serve after dinner with coffee and it was easy to make extra to have on hand as a lovely little pick-me-up throughout the day – straight from the freezer! Grate the raw cacao butter in the TM bowl on speed 8 for 15-20 seconds. Melt the butter on speed 2 at 37 degrees for 10 minutes or until fully melted. Add remaining ingredients to the TM bowl and cook for a further 10 minutes at 37 degrees, speed 1. Mix for 10 seconds at speed 5 to ensure the honey is fully emulsified. Poor into little heart moulds or similar and store in the freezer. If you have any left over, pour onto a square, shallow plate and freeze before breaking into shards to eat! Tip: Before pouring the chocolate into the moulds or onto the plate, pop a macadamia nut, almond, goji berry or some shredded coconut in first to create different flavoured truffles. Would love to hear any other variations you have tried! Categories: Food | Tags: cacao, chocolate, cocoa, graceandgusto, graceandgustofood, raw dessert, sweets | Permalink. … not together, I promise! These two favourites in our household are perfect for winter (if we ever get a winter that is!). We’ve always been big fans of oats for breakfast, but because we have it regularly I am always experimenting with different variations. My latest is Spiced Coconut Porridge which incorporates some anti-inflammatory spices into the mix, and replaces the milk or water with coconut milk and coconut water. You need very little sweetener as the coconut water is quite sweet on its own. The result was yum! 1. Add all the ingredients to the TM bowl and cook at 90 degrees for 11 minutes on speed 2. 2. 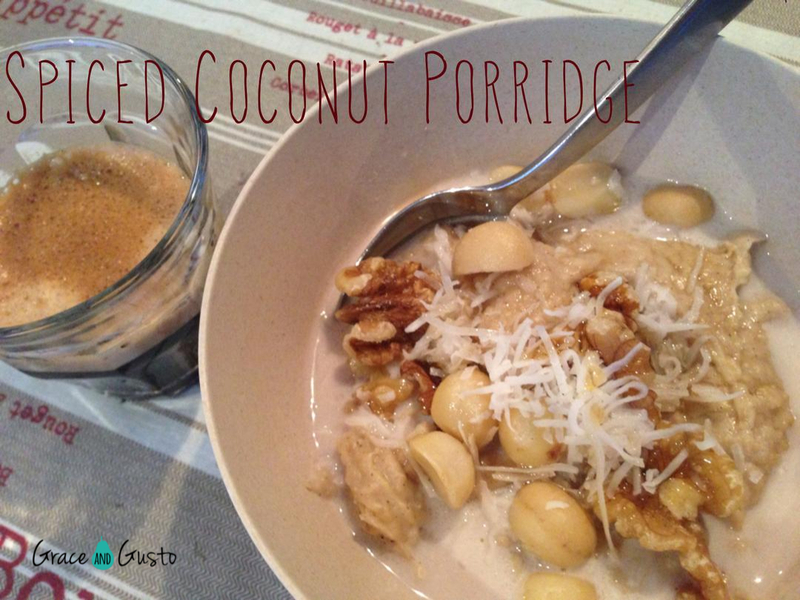 Watch the porridge for the last two minutes – you may need to add a little more coconut water if its too thick. 3. Serve with walnuts, macadamia nuts, shredded coconut and almond milk. I love fennel in salads during summer, but I think it’s a new favourite winter vegetable. 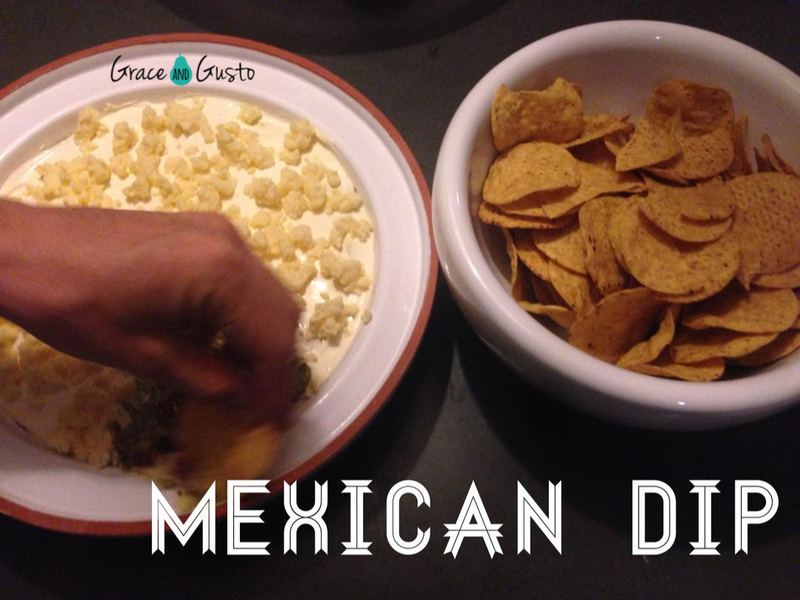 It’s super easy to prepare and really offers a nice change from your usuals. I’m all for getting as much variety as possible in our fruit and vegetable repetoire, so add this one in and tell me what you think! Fennel is an excellent source of vitamin C and contains phytonutrients that are anti-inflammatory, antioxidants and anti-cancer. Apart from all this great stuff, it tastes amazing! 1. Cut the base of the fennel off by about 1cm and trim the tips. Cut into 2-3cms slices, lengthways. 2. Bring a large saucepan of salted water to the boil and add the slices of fennel for 10 mins or until they’ve softened. 3. Drain well and lay the fennel across the bottom of a baking dish. Top with the cream, cheese and salt and pepper and bake for 15mins at 180 degrees fan forced or until golden brown. Serve immediately. Categories: Food | Tags: breakfast, fennel, Food, graceandgusto, graceandgustofood, porridge, vegetables, winter | Permalink.